competitions, he has performed in over 20 countries as a soloist, recitalist and chamber musician. A “remarkable violinist” with an already established concert reputation, with a tone that has been called “beautiful and moving,” his virtuosity “breathtaking”. Reviewed by The Los Angeles Times: “Puskás made sparks fly … always demonstrating great security and economy of motion”; furthermore “An exceptionally gifted and talented violinist” – by legendary violinist Ruggiero Ricci; and “A superb artist … with a distinctly personal style of playing" – The Chronicle. He has appeared in concerts and recitals in major festivals and concert halls around the world, including the Young Artist International in Los Angeles, the Saint Huber Festival of Belgium, International Festival of Beureuth, the Holland Music Sessions in the Netherlands, the European String Festival of Ireland, International Academy of Russia, Chateau sul Marne in France, the Nagano and Yokosuka festivals in Japan, and the Leopold Auer Festival of Hungary. Mr. Puskás also performed at the Grand Hall of the Franz Liszt Academy, the National Radio Marble Hall in Budapest, the prestigious Hall of the Composers Union in St. Petersburg (Russia) and in the Concertgebouw in Amsterdam. Rodrigo Puskás had been admitted to the Franz Liszt Academy of Music at the early age of 11 into the class of concert violinist Dénes Kovács, Head of String Department. At age 20 he moved to the United States, to further study with Dr. Eduard Schmieder (a former Oistrakh-student and successor of Jascha Heifetz at UCLA), Head of String Department at the Meadows School of Music and Arts, SMU in Dallas. Rodrigo Puskás was a six-time recipient of the Meadows Foundation Performing Arts Scholarship, winner of the prestigious Neimann Marcus Scholarship Award and recipient of a carreer-grant from the International Soros Foundation. At Southern Methodist University he received another postgraduate Artist Diploma and a Masters’ Degree in Violin Performance. Mr. Puskás was first prize winner of the Budapest Young Artist Competition, the Budapesti Szemle, the Budapest National Violin Contest, the János Koncz International Violin Competition, the Ruggiero Ricci Master classes & competition, the Béla Bartók Chamber Music Competition, the Nagano International Music Competition (2nd), the MCPAS Artists' Competition (also Audience Prize winner), and the Entergy Music Competition. His teachers of most influence were Dr. Eduard Schmieder (Head of String Dept. Meadows School, formerly chair of Jascha Heifetz at UCLA), Emanuel Borok (concertmaster of Dallas Symphony, former co-concertmaster of the Boston Symphony), Dénes Kovács (violin soloist, Head of String Dept. Franz Liszt Academy of Music), Ruggiero Ricci (violin soloist, Professor of Mozarteum, Salzburg), Dr. Sándor Devich (former violinist of the world-famous Bartók String Quartet) and the late Vilmos Tátrai (concertmaster National Philharmonic of Hungary, founder and 1st violinist of the Tátrai String Quartet). Mr. Puskás also studied with Prof. Igor Ozim (renowned pedagogue – Bern Hochschule), Miklós Szenthelyi (soloist, Leader of Hungarian Virtuosi), Ferenc Rados (Pianist, Professor of Chamber Music – Franz Liszt Academy), and Lászlo Kóté (violin soloist, former concertmaster of the Hungarian National Opera), among others. His orchestral carreer started at the very young age of 15, after the invitation of Maestro Erich Bergel (former Music Director of the Budapest Philharmonic and former Assistant of Herbert von Karajan at the Berlin Philharmonic Orchestra.) Mr. Puskás had toured with the Budapest Philharmonic and the Hungarian National Opera Orchestra several times as their youngest guest member. As an orchestral leader he held concertmaster positions in several orchestras, such as the Meadows Symphony, Abilene Philharmonic, Utah Festival Opera Orchestra, I-Palpiti Chamber Orchestra, IPAC Symphony Orchestra, Franz Liszt Academy Symphony, and worked as acting concertmaster in the Irving Symphony, Plano Symphony Orchestra, the Plano Chamber Orchestra, the Garland/Las Colinas and Arlington Symphony Orchestras. Mr. Puskás also performs with the Dallas Opera Orchestra and has been Concertmaster of the Daejeon Philharmonic Orchestra in South Korea since March 2005. Rodrigo Puskás has been pioneering performances of music by contemporary composers, and has premiered several works specially written for or dedicated to him, most recently a work by American composer Dr. Kevin Hanlon: “Blues for Nick” (aka. Niccoló Paganini). Having always been strongly interested in chamber music, Mr. Puskás performs with several ensembles regularly. He was a founding member and violinist for two major music-groups, performing both standard classical and so-called “new-classical” repertoire. Mr. Puskás has also been active in playing for non-profit organizations, most notably with great success in support of Interfaith, to raise funds for relief efforts after the 2004 Florida hurricane. He also performed various concerts in Japan in collaboration with violinist Prof. Victor Pikaizen benefiting handicapped children. Mr. Puskás has been a featured artist on “The Front Row,” a classical program on KUHF Radio of Houston. His performances from Beverly Hills Public Library and The Los Angeles Museum of Art were broadcasted live on the West Coast on KUSC, and performed/recorded extensively for the national station Bartók Rádió in Hungary. 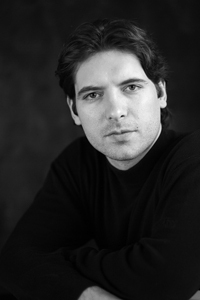 Each year Rodrigo Puskás performs in a concert series sponsored by the Hungarian Society of Musical Art, and since age 18 has been named permanent soloist of the Hungarian Broadcast Network.